After months of review and numerous discussions, considering all current North Carolina algorithms and evidenced-based recommendations, the Newborn Hypoglycemia Prevention and Care collaborative achieved one of the primary goals teams desired: a statewide protocol for Management of At-Risk Newborns for Hypoglycemia. Over 250 attendees at the initiative kickoff last week solidified these efforts and approved the document after careful review and expert engagement. 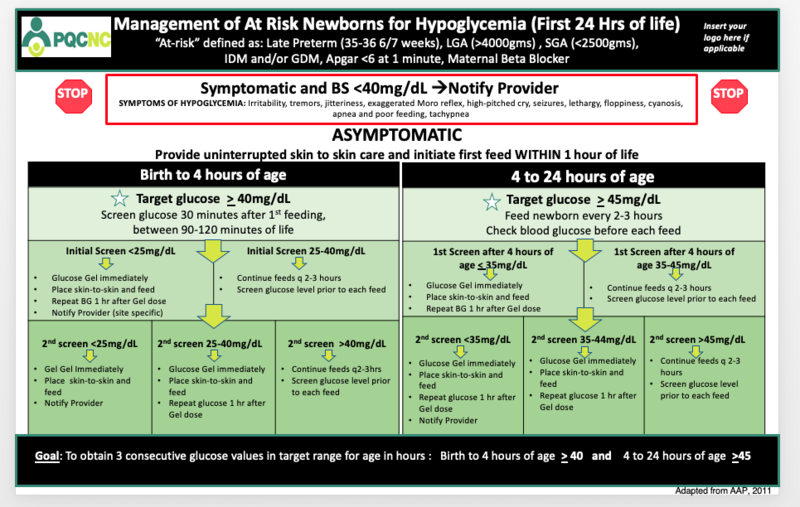 Mirrored after the 2011 American Academy of Pediatric (AAP) version, the North Carolina statewide algorithm takes it a step further and includes the use of glucose gel as an intervention. Blessed by Dr. David Adamkin himself, the author on the statement on Neonatal Hypoglycemia for the AAP, the resource is meant to provide teams with a standardized protocol right out of the gates, as we begin our work to improve care for the hypoglycemic newborn and those as risk.